Eight months after the Indian Ocean tsunami devastated the Indonesian province of Aceh, a long-awaited peace broke out in the region. It was on Aug. 15 that a peace accord between GAM (Free Aceh Rebels) and the Indonesian government was signed in Helsinki, Finland, bringing an end to 29 years of conflict. Under the International Crisis Group (ICG) sponsored agreement, on Sept. 18 Indonesia withdrew some 800 troops from the province. The government plans to step-up the pace to include four battalions, or more than 6,000 soldiers by the end of this week, with eventual plans to cut security forces in the province by half. This follows the rebels' decommissioning of arms last week. From Sept. 15-17 GAM began the first phase of the handing over of its weapons to the European-led Aceh Monitoring Mission (AMM). During this first phase, GAM members handed in over 250 weapons, according to the AMM. Aceh, a province of about 4.2 million located at the northern tip of Sumatra, has endured a conflict that has killed approximately 15,000 people, mainly civilians, since 1976. Devoutly Muslim and rich in natural resources such as natural gas, timber and coffee, Aceh is poised to reap substantial economic rewards if the deal holds. According to Sidney Jones, project director for the ICG, the deal has "a better than 50 percent chance" of success. In dramatic scenes in the provincial capital of Banda Aceh Sept. 15, rebels drove up in motorcycles and trucks brandishing their automatic rifles and machine guns. Raising them over their heads in front of a crowd of journalists and local citizens, they promptly handed them over to members of the AMM who then put the weapons under brand new white BOSCH electric saws to be sliced into pieces. The remaining fragments are to be made into works of art. The agreement between the Indonesian government, AMM and GAM states that the rebels would hand over 840 weapons in total. That would still leave some in the hands of rebels. Sofyan Djalil, Minister of Communication and Information, told TEMPO magazine, "Between three to four GAM members might have only one weapon between them," unlike the Indonesian military (TNI) where all personnel have one weapon each. 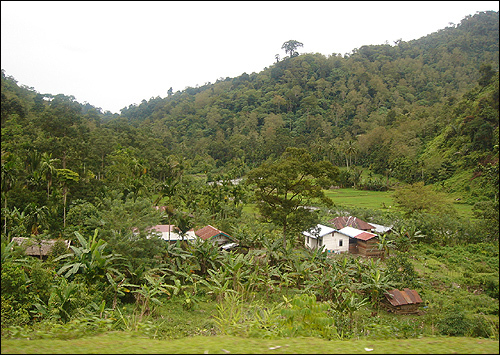 While visiting Aceh two weeks after the peace accord was signed, I was forced to take a trip over rough, mountainous terrain across the province from Banda Aceh to Meulaboh. A trip that took only three hours before the tsunami, takes nine hours today because the original road has not yet been repaired. 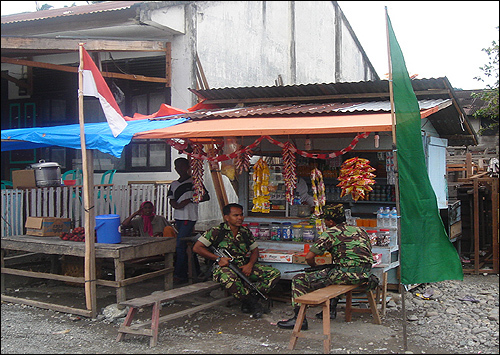 Along the way, my minivan was stopped repeatedly by TNI soldiers brandishing automatic rifles. Some soldiers hopped in the van for a ride or asked for cigarettes or sweets. I was seated in the front seat and as soon as I was spotted the soldiers broke into wide smiles and waved us on. Had I not been present who knows what could have happened. I was told that money often exchanged hands at these stops. After the signing of the peace accord, innocent civilians should not be subjected to unwarranted searches or delays. After more than six months of difficult negotiations, a major breakthrough occurred in May when the GAM rebels dropped their longstanding demand for complete independence. In return, the government of Susilo Bambang Yudhoyono agreed to grant rebels an amnesty and hand over greater autonomy of the province's economy. Another concession was to allow GAM into the political mainstream by allowing it to form political parties. However, this could be a potential stumbling block. Such an arrangement requires changing Indonesia's constitution and the consent of the House of Representatives. Members of former president Megawati Sukarnoputri's Indonesian Democratic Party of Struggle (PDI-P), have already indicated their unwillingness to do so. According to Teuku Risman, leader of the local Meulaboh Fishermen's Union, some in the government would like to see the agreement fail. . "We are still afraid of politicians outside of Aceh," he says. "Some politicians have been made rich through the conflict," he said.